Cartoon is an important medium to communicate people’s messages. Why not supplement your characters-only leaflets and posters with cartoon! The “Caricature Workshop” that will be held on November 29 and 30 at MediR attempts to incorporate cartoon into social movement more proactively. The lecturer is Lee Kijin, a South Korean researcher of caricature focusing on the issues of war and poverty and the criticism of power. 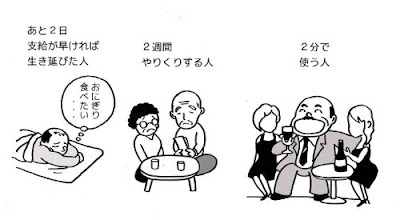 She will explain how to appeal with caricature from various angles, such as its history in Japan and the world. Anybody is welcome if interested in expressing with cartoon. (Ichihanahana) Past and present caricature in the world. *Left: Cartoon by Lacoste, 2008. 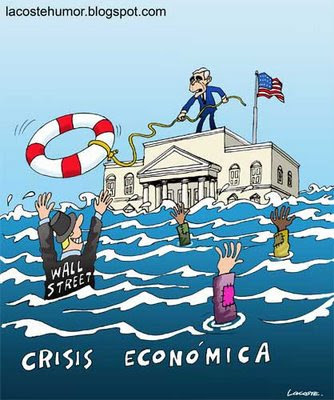 Satirizing the economic crisis. A float from the White House is thrown to rescue the Wall Street, not the poor. 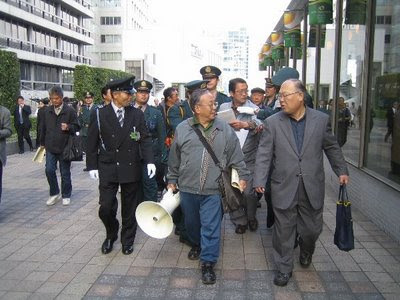 Three arrested attempting to view Prime Minister Aso’s mansion. 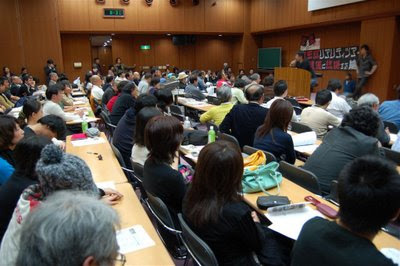 On October 24, a national railway meeting was held at Hibiya Yaon in Tokyo by the“Four Organisations, Four Unions”, involving, according to event sponsors, 11,200 participants principally from labour unions. 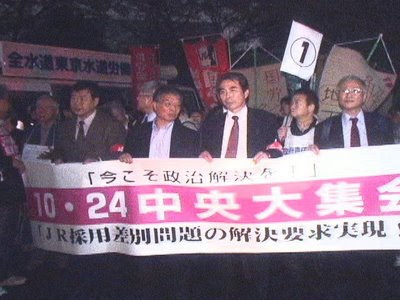 Participating organisations included Kokuro, Zendoro and the plaintiffs of Japan Railway Construction Public Corporation lawsuit. 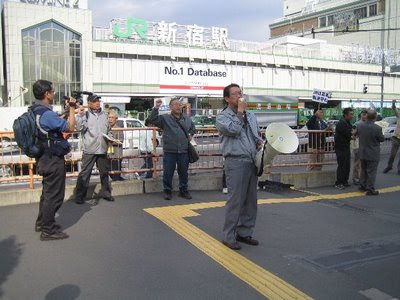 The meeting heard a variety of speeches, including an inspiring speech from Satoshi Kamata, and others expressing their determination to continue the struggle. 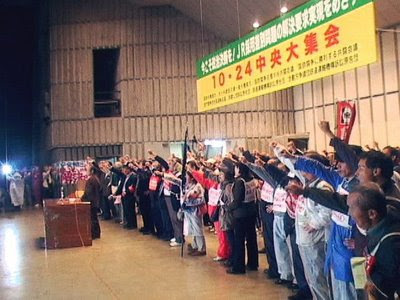 The organisations and family members affected by the dismissal travelled from as far as Hokkaido and Kyushu to participate in this event. One family said that they wanted this event to be the last, but that they couldn’t give up on their demands for employment, pensions and a settlement. Unfortunately, the event was marred by disruptive heckling from a group that opposed the political strategy of the “Four Organisations, Four Unions”, who had dropped their demand for the dismissed workers to be reinstated. 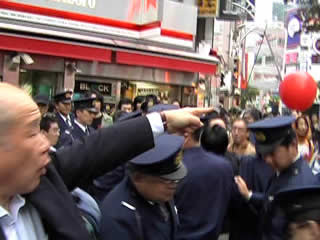 Participants also demonstrated in Ginza and demanded a prompt resolution of the JR dispute. *Photo of the organisations and family members chanting. Surrounding the Supreme Court with ribbons to appeal against gender-based wage discrimination. On October 22 at 11am, blue skies were visible as women surrounded the Supreme Court, holding ribbons and chanting “Fair days pay for women’s work!” (see photo). 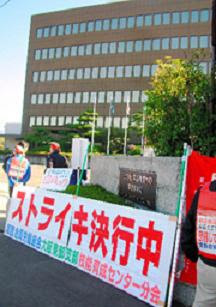 The Supreme Court is currently hearing two cases of gender-based wage discrimination: Mitsue Nozaki vs. Showa Shell Sekiyu; and Kanematsu Corporation. Despite both cases achieving partial victories in the high courts, the judge limited their victory by ruling that discrimination before the enactment of the Law for Equal Employment Opportunity would not be considered. One hundred and twenty people, mainly women, gathered to support the plaintiffs and to appeal to the Supreme Court. The organiser Yasuko Yunoki, emphasised that this case will lead to changing structural wage discrimination in various types of employment, including regular employees, non-regular and part-time. Source: UnionTube video and Show Shell Labour Union homepage. 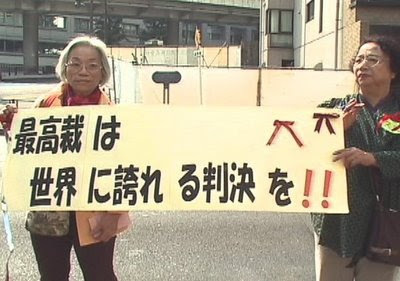 Keep Keihin Hotel open! No to closure and redundancies! The Keihin branch of Tokyo Union received notice on October 20 from the Keihin Hotel (located in front of Shinagawa station, Tokyo) that all 130 employees would be made redundant and the hotel closed due to its ailing business from the Lehman bankruptcy. The Union is fighting back with their demands that the hotel be kept open and management reinstate the workers. 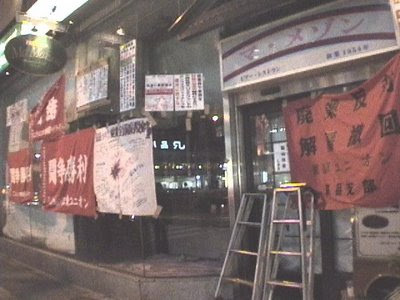 On the evening of the 20th, approximately 100 people gathered, including supporters and media, to protest in front of the hotel (see photo). The Chair of the union angrily spoke out against the management’s actions: “Everyone has families to support. Why should workers have to foot the bill for management’s recklessness?” Some women workers were in tears as they protested. The Union is occupying the Hotel while, at the same time, applying for an injunction on the 21st to uphold their demands. 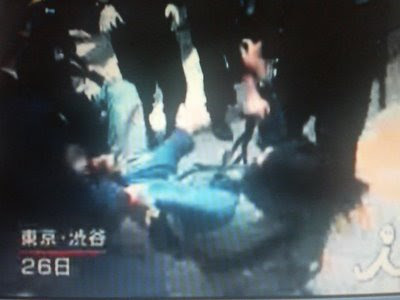 Source: Freeter Workers Union online magazine and Keihin Hotel occupiers’ blog. Let’s change society to change politics! 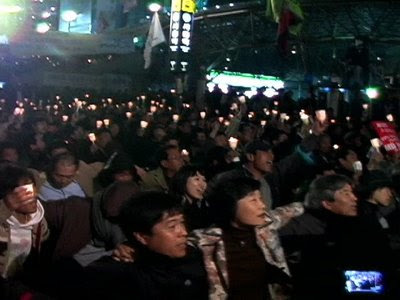 Two thousand participants speak out against poverty and for social reform. 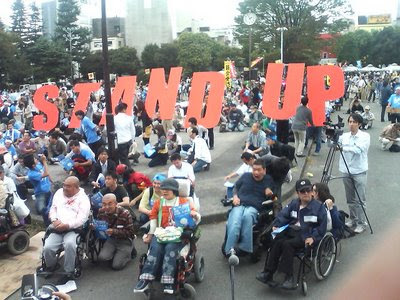 On October 19, approximately 2000 people participated in a mass meeting against poverty and for social reform, held in Meiji Park in Tokyo. 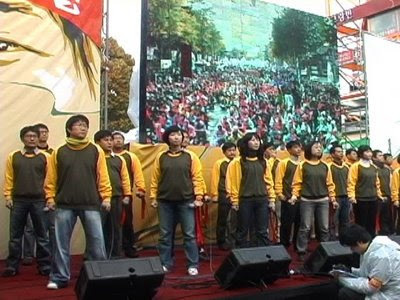 The event was lively throughout the day with music, a rally, stalls, subcommittee meetings and a parade. People in wheelchairs and the elderly were a visible presence, and the event was a space for the socially vulnerable to speak out directly. There were 12 subcommittees, but the Labour subcommittee, in particular, attracted many participants. The harsh reality of the workplace and the struggles inspired there were highlighted. 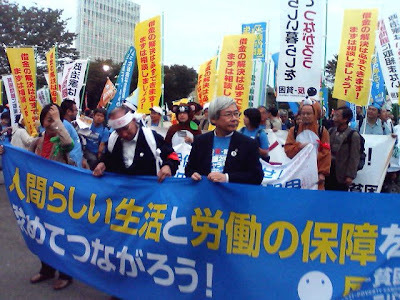 Makoto Yuwasa powerfully declared that: “I’m sick of losing because of the small differences. Let’s go beyond these walls and find our peers on the other side. We can all take one step closer towards this goal. Let’s change society and we can change politics”. 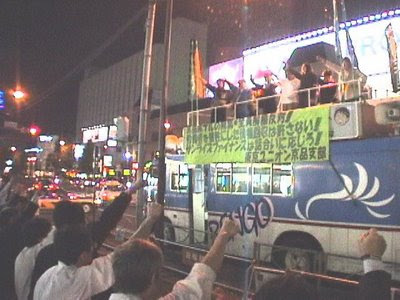 Participants, with their originally designed merchandise in hand, made their way to the demonstration in Shibuya.